I’d like to invite you to join me on a journey to explore the state of Customer Experience Design in a new series I am producing and hosting, #CXDNow. Sponsored in part by IBM’s new Journey Designer product, together we will endeavor to “advance the field” through conversations with subject matter experts and leading practitioners. Further, as a community of practitioners, we will collaboratively work on developing a journey map for my new community project, We Are The Solution, putting the principles into practice in real time, together. The series kicks off this Friday October 2, 2015 at 4pm PDT with a live Blab interview featuring Brian Solis, whose upcoming book “X – The Experience When Business Meets Design” dives very deeply into this subject. Together we will set the stage for the following six episodes to explore what CXD is, why we need it and how it is done. Then next Wednesday October 7, 2015 at noon PDT, we will discuss “The Need for Customer Experience Design and Journey Maps”. During that show, I will be interviewing Doug Folds, the product manager for IBM’s new Journey Designer product and one of the sponsors of the show to discuss his plans for bringing the practice of Customer Experience Design into the mainstream as a #NewWayToEngage. If you are a customer experience designer, a journey mapper, an omni-channel marketer, a startup founder, a product manager or just someone who is interested in understanding this important topic further, #CXDNow is where you will expand your knowledge and hone your skills. Over the course of the series we will develop a body of work for the community that examines the business case, the core concepts and the specific practices that will enable you to design great experiences that enable your customers to find success on their journey. While CXD has been around for quite some time now (often referred to as simply #CX, a cousin to #UX), it is just now finally coming into it’s own, hence the name of the show, #CXDNow. The Intention is to not only address the current state of the field but also to impress upon the business community the urgency for adopting these practices NOW. Given the soon to be released book, “X – The Experience of Business Meets Design” from my friend and colleague Brian Solis, and the other increase in interest and focus on this subject from organizations like IBM and others, the time to better understand this subject is definitely upon us. I first began exploring the idea of journey mapping while working as the Chief of eBusiness at the United States Mint back in 1999, where I was charged with digital marketing responsibilities for the numismatist community (aka coin collectors). 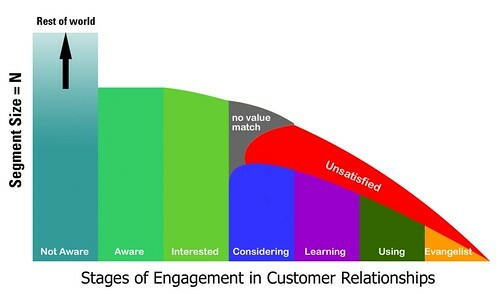 It was there that I developed what I called the “Customer Experience Lifecycle” (below), which later lead to my development of the Engagement Matrix while working with Palm and ultimately the Engagement Wheel while working with the American Heart Association while serving as a Social Business leader at Deloitte Digital. While each show in the series and posts to this blog will address its own set of issues, I am, as is often the case, looking at this opportunity more holistically. At the end of the series, it is my hope that we will have produced a unique collection of insights and resources that can be utilized to bring Customer Experience Design to more organizations and more opportunities to customer experience designers as a result. The show will take the form of a weekly conversation with leading experts on Blab.IM. If you are a customer experience designer interested in being a guest on the show, or someone working to advance the field, please complete this simple form so we may consider you as a future guest. Through the use of the hashtag #CXDNow, we will curate a set of resources for practitioners and collectively discuss a key question each week. The media produced will be gathered into multiple blog posts for posterity and further conversation right here on ChrisHeuer.com. Templates (aka Canvases) will be produced and shared that embody the best advice from practitioners. While I am not anticipating building another Social Media Club for CXD, the possibilities of what we can do together as a community are endless. That said, I am seeking your support and input to solve a massively important social problem through our work on the journey maps we are developing for We Are the Solution. Together, we will explore how can we build a movement of activism focused on cooperation in the development of reasonable solutions, instead of activism through opposition. I am grateful to my friends at IBM, PureMatter and from across the Social Media Club community for the opportunity to bring together many of my diverse talents and interest in this series, and look forward to expanding awareness of the importance of Customer Experience Design as well as the skills of its diverse practitioners. So join me this Friday afternoon at 4pm PDT as I interview Brian Solis and again next Wednesday October 7, 2015 at noon PDT as we launch our journey towards #CXDNow. To get started, the question of the week for you to consider, “Why do we need Customer Experience Design now more than ever?” Tweet your responses back to me using the hashtag #CXDNow and we will discuss them on the show.